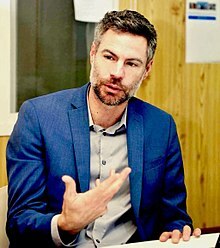 Michael Shellenberger is an American author, environmental policy writer, cofounder of Breakthrough Institute and founder of Environmental Progress. He was named a Time magazine Heroes of the Environment (2008), winner of the 2008 Green Book Award, co-editor of Love Your Monsters (2011) and co-author of Break Through (Houghton Mifflin 2007) and The Death of Environmentalism (2004). He and his co-author Ted Nordhaus have been described as "ecological modernists" and "eco-pragmatists." In 2015, Shellenberger joined with 18 other self-described ecomodernists to coauthor An Ecomodernist Manifesto. On November 30, 2017, he announced during a New York Times conference that he would run for Governor of California in 2018. Shellenberger's early writing and activism focused on Latin America and he was introduced to activism and political direct action due to being raised a Mennonite. That work included the founding of an Amnesty International chapter in high school in Greeley Colorado, and debating Latin American policy, for which he attended the National Forensic League Championships. He traveled and worked in Latin America in the 1980s and 1990s. In 1993 he moved to the San Francisco to work with progressive organization, Global Exchange, authoring articles on Haiti, Brazil Mexico, Gulf War syndrome, and affirmative action. At UC Santa Cruz he helped organize a graduate students union and defend affirmative action. Later he co-founded Communication Works, an allied progressive public relations organization. which worked on a wide range of campaigns, from challenging Nike over its labor practices in Asia, to saving the Headwaters Redwood forest. In 2002 Shellenberger co-founded the consulting firm Lumina Strategies. In 2004, Schellenberger was hired as a lobbyist and political consultant for Venezuela's President Hugo Chavez and was credited for helping Chavez win election. Its clients included Global Exchange, Americans United for Affirmative Action, the Ford Foundation, the Sierra Club, and the Venezuelan Information Center. In 2005 Shellenberger and Nordhaus co-founded American Environics, whose clients include AARP, Earthjustice, the Ford Foundation, and the Nathan Cummings Foundation. Shellenberger was president and a senior fellow at the Breakthrough Institute, which he co-founded with Ted Nordhaus in 2003. Today, Breakthrough Institute consists of a policy staff, an annual conference, a policy journal, and a network of affiliated fellows. Shellenberger has co-authored analyses of cap and trade climate legislation, of the "planetary boundaries" hypothesis, energy rebound from energy efficiency measures, carbon pricing, renewable energy subsidies, nuclear energy, and shale gas. The Institute argues that climate policy should be focused on higher levels of public funding on technology innovation to "make clean energy cheap," and has been critical of climate policies like cap and trade and carbon pricing that are focused primarily on raising energy prices. The Institute has conducted research showing that shale gas and other major technological innovations were created by American government institutions and public financing. The Institute advocates higher levels of public spending on technology innovation, which they argue will lead to higher environmental quality, economic growth, and quality of life. In January 2016, alongside several other authors of An Ecomodernist Manifesto—including Robert Stone, David Keith, Stewart Brand and Mark Lynas—as well as Kerry Emanuel, James Hansen, Steven Pinker, Stephen Tindale and Burton Richter; Shellenberger signed an open letter urging not to close the Diablo Canyon nuclear power plant. It was addressed to California Governor Jerry Brown, the CEO of Pacific Gas & Electric and California state officials. In April 2016, Shellenberger, alongside other conservationists and scientists—including James Hansen, Stewart Brand, Nobel Laureate Burton Richter, Kerry Emanuel and Mark Lynas—signed an open letter urging against the closure of the six operating nuclear power plants in Illinois: Braidwood; Byron; Clinton; Dresden; LaSalle; and Quad Cities. Together, they account for Illinois ranking first in the United States in 2010 in both nuclear capacity and nuclear generation, and generation from its nuclear power plants accounted for 12 percent of the United States total. In 2007, 48% of Illinois's electricity was generated using nuclear power. In July 2016, an open letter signed by climate scientists, scholars, environmentalists and concerned citizens was sent to Governor Andrew Cuomo and leaders within New York's Public Service Commission, urging them to support legislation that would protect New York's nuclear plants from closure, including the Indian Point nuclear power plant. In August, Cuomo announced that the PSC had formally approved a Clean Energy Standard (CES) that explicitly recognises the zero-carbon contribution of nuclear power plants. In July 2017, Shellenberger, with colleagues and associates of Environmental Progress sent an open letter to South Korean President Moon Jae-in urging him to reconsider his nuclear phase-out proposal, given the importance of South Korea's nuclear program to protecting the climate. In August 2017 a comprehensive report, "The High Cost of Fear" was published, outlining the likely impacts on South Korea of that proposal. In October 2017, a South Korean citizen's jury voted to restart the construction of two halted nuclear reactors. In 2017, Shellenberger told The Australian: "Like most people, I started out pretty anti-nuclear. I changed my mind as I realised you can't power a modern economy on solar and wind... All they do is make the electricity system chaotic and provide greenwash for fossil fuels." In 2004, Nordhaus and Shellenberger, both long-time strategists for environmental groups, co-authored a controversial essay, "The Death of Environmentalism: Global Warming Politics in a Post-Environmental World." The paper argues that environmentalism is conceptually and institutionally incapable of dealing with climate change and should "die" so that a new politics can be born. The essay was debated, and continues to be widely discussed and taught. In, 2007, Houghton Mifflin published Nordhaus and Shellenberger's Break Through: From the Death of Environmentalism to the Politics of Possibility (Houghton Mifflin, 2007). Wired Magazine called Break Through "the most important thing to happen to environmentalism since Silent Spring." The book is an argument for what its authors describe as a positive, "post-environmental" politics that abandons the environmentalist focus on nature protection for a new focus on technological innovation to create a new economy. Time Magazine named Nordhaus and Shellenberger two of its 32 Heroes of the Environment (2008) calling Break Through "prescient" for its prediction that climate policy should focus not on making fossil fuels expensive through regulation but rather on making clean energy cheap. Break Through was awarded the Green Book Award, 2009, whose other recipients include E.O. Wilson and James Hansen. Their writings have focused on the intersection of climate change, energy innovation, and politics. The two predicted the failure of cap and trade for its focus on making fossil fuels expensive rather than on technology innovation to make clean energy cheap. They faulted the Kyoto climate treaty for being focused on what they called "shared sacrifice" rather than shared technological innovation. They have criticized green cultural life as a consequence of status anxieties among Western consumers. And they have argued for a "theology" of ecological modernization that embraces technological innovation and human development. Nordhaus and Shellenberger have argued for a "climate pragmatism" and an embrace of modernization and human development. They are co-authors of an alternative framework to the United Nations process focused on energy innovation, pollution control and adaptation. In 2011, Nordhaus and Shellenberger started The Breakthrough Journal, which The New Republic called "among the most complete efforts to provide a fresh answer" to the question of how to modernize liberal thought, and The National Review called "...the most promising effort at self-criticism by our liberal cousins in a long time." The writings of Shellenberger have been praised and criticized. Wired magazine wrote that Break Through "could turn out to be the best thing to happen to environmentalism since Rachel Carson's Silent Spring." The Wall Street Journal wrote, "If heeded, Nordhaus and Shellenberger's call for an optimistic outlook -- embracing economic dynamism and creative potential -- will surely do more for the environment than any U.N. report or Nobel Prize.". Former Sierra Club Executive Director Carl Pope, wrote, "I am deeply disappointed and angered by" "The Death of Environmentalism," which he called "shoddy" and "unclear, unfair and divisive." Former Greenpeace Executive Director John Passacantando said, referring to both Shellenberger and his coauthor Ted Nordhaus, "These guys laid out some fascinating data, but they put it in this over-the-top language and did it in this in-your-face way." Michel Gelobter and others with an environmental justice perspective criticized Death for not addressing the concerns of poor people who were not white, and wrote The Soul of Environmentalism: Rediscovering transformational politics in the 21st century in response. Shellenberger was raised in Greeley, Colorado and attended college at Earlham College, a Quaker school in Richmond, Indiana. He went on to receive a master's degree in Cultural Anthropology from the University of California, Santa Cruz. Shellenberger has two children and resides in the San Francisco Bay area. ^ a b Walsh, Bryan (24 September 2008). "Heroes of the Environment 2008". Time. ISSN 0040-781X. Retrieved 26 April 2018. ^ a b "Stevens' Center for Science Writings honors environmental critics with Green Book Award". EurekAlert!. 9 January 2008. Retrieved 26 April 2018. ^ a b c Barringer, Felicity (6 February 2005). "Paper Sets Off a Debate on Environmentalism's Future". The New York Times. ISSN 0362-4331. Retrieved 26 April 2018. ^ Pearce, Fred (15 July 2013). "New Green Vision: Technology As Our Planet's Last Best Hope". E360.yale.edu. Retrieved 26 April 2018. ^ Kloor, Keith (12 December 2012). "The Great Schism in the Environmental Movement". Slate. ISSN 1091-2339. Retrieved 26 April 2018. ^ "A manifesto for a Good Anthropocene". An ECOMODERNIST MANIFESTO. Retrieved 2016-01-26. ^ "Untying the Nuclear Knot". Youtube.com. 30 November 2017. Retrieved 26 April 2018. ^ R. Baker, David (30 November 2017). "Pro-nuke activist from Berkeley to run for California governor". SFGate. Retrieved 26 April 2018. ^ Shellenberger, Michael (November 21, 2017). "Why I changed my mind about nuclear power: Transcript of Michael Shellenberger's TEDx Berlin 2017". ^ Sharon, Dunn (17 February 2013). "Greeley Central High School graduate waxes philosophic on energy". The Tribune. Retrieved 26 April 2018. ^ "LETTERS TO THE EDITOR". The San Francisco Chronicle. January 11, 1996. Retrieved 26 April 2018. ^ "Fed-Up Brazilians Want Political Change". The New York Times. 27 December 1993. Retrieved 26 April 2018. ^ "Has Brazil Earned Security Council Seat?". The New York Times. 22 April 1995. Retrieved 26 April 2018. ^ Maria Imaz, Jose; Shellenberger, Michael (22 April 1996). "Yoked by Debt, Mexicans Find a Voice : Economy: Hit by crushing financial burdens, middle-class citizens flock to a group fighting business-as-usual government". Los Angeles Times. Retrieved 26 April 2018. ^ Shellenberger, Michael (27 May 1996). "Remembering the Gulf War - and its sick vets". The San Francisco Chronicle. Retrieved 26 April 2018. ^ "Affirmative Action Is No Bar to Ambition". The New York Times. 6 May 1996. Retrieved 26 April 2018. ^ "Search the San Jose Mercury News Archive". Nl.newsbank.com. Retrieved 13 August 2018. ^ Armstrong, David (5 August 1997). "Progressive PR". San Francisco Chronicle. Retrieved 26 April 2018. ^ "New firm founded". PR Week. 2002-09-02. ^ "Venezuela's Information Office hires Michael Shellenberger | www.vcrisis.com". www.vcrisis.com. Retrieved 2019-03-05. ^ Collier, Robert; Writer, Chronicle Staff (2004-08-21). "Venezuelan politics suit Bay Area activists' talents / Locals help build Chavez's image, provide polling data". SFGate. Retrieved 2019-03-05. ^ Collier, Robert (21 August 2004). "Venezuelan politics suit Bay Area activists' talents". San Francisco Chronicle. Retrieved 26 April 2018. ^ "Schellenberger's filing to US DoJ Foreign Agent Registration Unit" (PDF). Fara.gov. Retrieved 26 April 2018. ^ Franke-Ruta, Garance (18 January 2006). "Remapping the Culture Debate". The American Prospect. Archived from the original on 25 December 2007. Retrieved 26 April 2018. ^ Garofoli, Joe (16 June 2011). "Thinkers take liberalism apart in order to save it". SFGate. Retrieved 26 April 2018. ^ Schmitt, Mark (30 June 2011). "Breakthrough Journal: Has Liberalism Entered a Post-Obama Era?". New Republic. Retrieved 26 April 2018. ^ "About". Thebreakthrough.org. Retrieved 26 April 2018. ^ Joyce, Christopher (11 March 2012). "Nuclear Woes Push Japan Into A New Energy Future". NPR. Retrieved 26 April 2018. ^ B White, Joseph (27 January 2011). "Obama's Energy Shift: It's Not About Climate". The Wall Street Journal. Retrieved 26 April 2018. ^ "Role Government Energy Innovation, May 22 2012 | Video | C-SPAN.org". C-SPAN.org. Retrieved 26 April 2018. ^ Walsh, Bryan (2009-06-27). "What the Energy Bill Really Means for CO2 Emissions". Time. ISSN 0040-781X. Retrieved 2018-04-26. ^ a b c Leonhardt, David (2012-07-21). "Opinion | A Ray of Hope on Climate Change". The New York Times. ISSN 0362-4331. Retrieved 2018-04-26. ^ "Putting A Financial Spin On Global Warming". Npr.org. Retrieved 13 August 2018. ^ a b McDonnell, Tim (3 February 2016). "Closing This Nuclear Plant Could Cause an Environmental Disaster". Mother Jones. Foundation For National Progress. Retrieved 11 February 2016. ^ "Open letter: Do the right thing — stand-up for California's largest source of clean energy". Save Diablo Canyon. Retrieved 11 February 2016. ^ Conca, James. "Illinois' Nuclear Dilemma Embroils Famed Climate Scientist James Hansen". Forbes. Forbes Inc. Retrieved 7 April 2016. ^ "Illinois - State Energy Profile Overview - U.S. Energy Information Administration (EIA)". Eia.gov. 2015-03-19. Retrieved 2016-02-27. ^ "State Nuclear Profiles: Illinois". U.S. Energy Information Administration. 26 April 2012. Retrieved 7 April 2016. ^ "EP open letter to New York PSC". Environmental Progress. 2016-07-14. ^ "New York Clean Energy Standard announcement". World Nuclear News. 2017-02-08. ^ "Open letter to South Korean president Moon Jae-in". Environmental Progress. 2017-05-07. ^ "EP report: "The High Cost of Fear"" (PDF). Environmental Progress. 2007-08-22. ^ "Pro-nuclear win in South Korea". Environmental Progress. 2017-10-19. ^ "Subscribe | theaustralian". Theaustralian.com.au. Retrieved 14 September 2017. ^ "404 Error Page". Aaahq.org. Retrieved 13 August 2018. ^ "GO 231 Environmental Politics and Policy Syllabus". Skidmore.edu. Retrieved 13 August 2018. ^ "Wayback Machine". Web.archive.org. 10 January 2009. Retrieved 13 August 2018. ^ "Orion Magazine - Evolve". Orionmagazine.org. Retrieved 13 August 2018. ^ WALSH, BRYAN (24 September 2008). "Heroes of the Environment 2008 - TIME". Content.time.com. Retrieved 13 August 2018. ^ "Dead movement walking?". Salon.com. 14 January 2005. Retrieved 13 August 2018. ^ Barringer, Felicity (February 6, 2005). "Paper Sets Off a Debate on Environmentalism's Future". The New York Times. ^ Garofoli, Joe (April 23, 2005). "New life through 'Death' / Authors shake up environmentalism with essay on movement's fatal flaws". SFGate. ^ Gelobter, Michel; Dorsey, Michael; Fields, Leslie; Goldtooth, Tom; Mendiratta, Anuja; Moore, Richard; Morello-Frosch, Rachel; Shepard, Peggy M.; Torres, Gerald (27 May 2005). "The Soul of Environmentalism Rediscovering transformational politics in the 21st century". Grist. Archived from the original on 11 July 2005. ^ a b "Michael Shellenberger" (PDF). Thebreakthrough.org. Retrieved November 7, 2013. ^ a b Mark Horowitz (September 25, 2007). "Two Environmentalists Anger Their Brethren". Wired.com. Archived from the original on November 4, 2013. Retrieved November 7, 2013.